Deluxe, fully adjustable leather head harness with mouth bit and eye blinders. 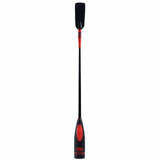 Detachable 14-inch lead, 5-inch mouth bit. The harness is adustable around the neck, chin and head and fits up to a 22-inch circumference around the head. Strong buckle fastenings, quality leather finish.